We are a friendly and inviting wargaming club, who meet weekly on Tuesdays between 18:00 and 22:00. 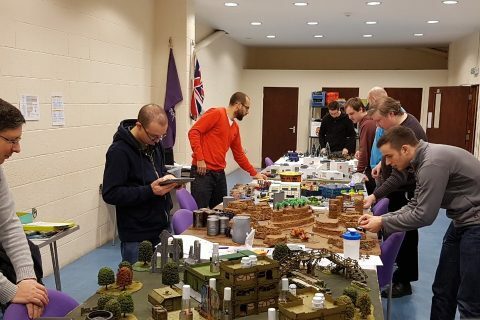 We enjoy an average attendance of 8-12 members per week, and play a variety of games including (but not limited to) Infinity, Warmachine/Hordes, Epic and Warhammer 40K. Membership costs £3 per week, and includes tea and coffee. The first week for new attendees is free! Even though I had started updating the Scenario Selector for ITSX and the new Classified Deck, I have decided to retire it as someone else has done the job already – and better than I could have done it too! Huge thanks to Andrew Galea for visiting us on the 5th. Everyone had a great time, and a lot of interest was generated! Suffice to say that this game will be a permanent fixture here on in, and demos will be available to anyone who wants to learn more about this great game, now that we are up to speed having been taught by the master! Photos from our evening, below.